With an icy high of 26 degrees today, it’s hard to remember what the Inland Northwest’s pleasantly warm summers even feel like anymore, but that doesn’t mean summertime attractions like North Idaho’s Silverwood Theme Park aren’t working to prepare for the coming warmer temps. The theme park, on U.S. Highway 95 in Athol, Idaho, announced today the addition of two new rides this year that will join the ranks of its 65 other rides and attractions. One is a 104-foot tall thrill ride that’s yet to be named — a contest to name the ride runs through Feb. 22 on the park’s website, reportedly, though we couldn't find a link yet [UPDATE: here] — and which Silverwood purchased from an Italian manufacturer. The ride seats 24 passengers and exhibits a force of 3 1/2 Gs, Silverwood says in a press release. It’s expected to arrive in mid-April and should be installed by the park’s 2013 season opening date of May 4. The second new attraction coming to Silverwood is a 20-passenger family ride called the Barnstormer, purchased for $200,000. The Barnstormer has already arrived from Scotch Plains, N.J., where the Bowcraft Playland amusement park is located. Bowcraft’s website lists a ride of the same name, though Silverwood’s press release didn’t mention whether the Barnstormer ride was purchased from Bowcraft. It says, however, that the Barnstormer is one of two rides like it in the U.S., with the other located at Six Flags Great Adventure, also in New Jersey. 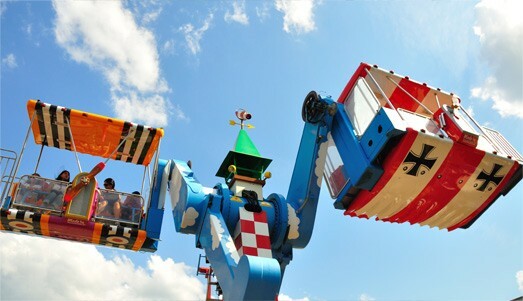 The new Barnstormer ride as pictured on Bowcraft's website. The Barnstormer will be installed as soon as weather permits and is set to be operating by the park’s opening date. As of this blog post, a countdown on its website shows 101 days and 22 hours until opening day on May 4.